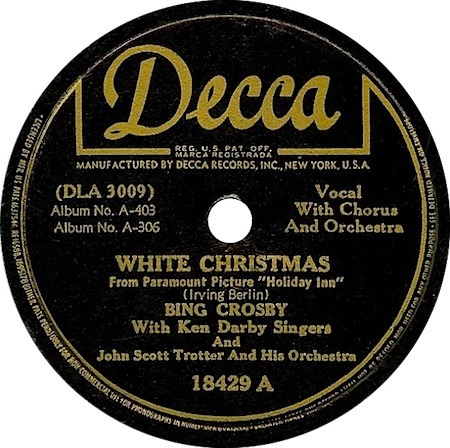 Bing Crosby recorded the original version of "White Christmas" on 29 May, 1942, together with the John Scott Trotter Orchestra and the Ken Darby Singers. This recording was released as part of the "Holiday Inn" album of songs, Decca Album No. A-306, consisting of six discs. In the film "Holiday Inn," the song was sung as a duet, and won an Academy Award as Best Original Song for Irving Berlin, its writer. Because of damage to the master recording, Crosby rerecorded "White Christmas" on 18 March, 1947, with the same prchestra and backing group. This is the version most often heard nowadays. The song featured again in a Bing Crosby film, this time in "White Christmas" in 1954. Elvis's version is nothing like the Crosby interpretation, being much closer to the Drifters' 1955 recording.